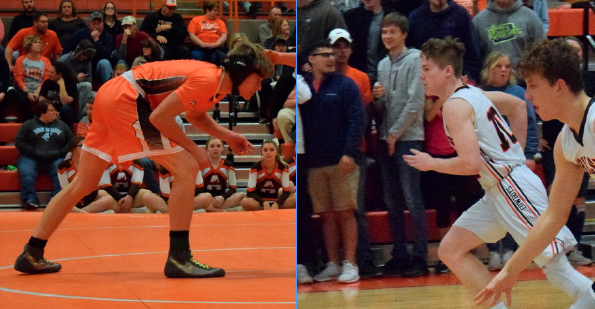 Braydon Surritte and Wyatt Davis have both provided excellent backup options as seniors in their respective winter sports. HAYS, KS – Thomas More Prep-Marian – Three minutes had passed, and head boys’ basketball coach Terry Taylor knew it was time to enact his strategy. At the whistle, out came the five starters in brown, and into the game came five different ones. Of course, the highlight of that group, to many casual Cowboy fans, were underclassmen Josh Stuber (sophomore) and Kaleb Becker (freshman). Still, two of the more productive chess pieces Taylor enlists are seniors – Colton McVan, older brother of student section fan favorite Blaise McVan, and Wyatt Davis. Wyatt (seventh from the right) and the rest of the Cowboys during pregame announcements. In total, there are six seniors on the team–four of whom are normal starters–in Damian Hartman, James Mayden, Tim Barbieri, Colton McVan, Preston Boyd, and Davis. Davis joined the team as a freshman and immediately struggled to find playing time. Logged as a guard behind Hartman and Mayden, Wyatt would find himself in the game during situations in which his depth was required, or, in multiple cases, the scoreboard was lopsided. Then came his junior season. 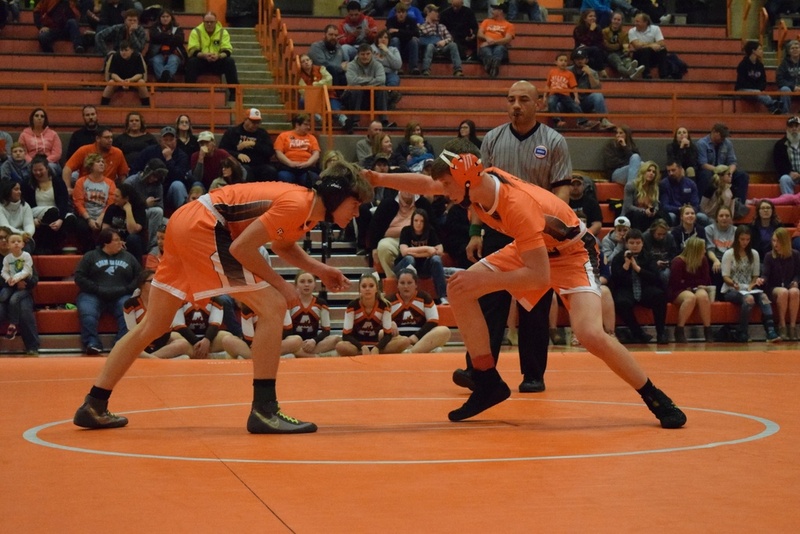 Davis (left) and freshman Kaleb Becker versus Chapman on December 18th, 2018. It started off much like the others did–he was a chess piece in late game situations for the front half of the season, even as Mayden and Hartman found themselves on the starting roster, alongside sophomore Travis Beetch. It looked like Wyatt would be spending the entirety of his third season on the bench. Determined to change the script, Wyatt improved his defense significantly by changing his style. He began to play press coverage, focusing on harassing the person with the ball into making mistakes or turning the ball over. His ferocious style is devoted to stealing the basketball, but also focuses on stopping the ball handler in his tracks and forcing him to find an out. He has provided pivotal defensive assistance in stands against teams like Concordia, Chapman, and–in the case in Hays–TMP, where he managed 7 points in one of his best defensive efforts. He started a game this season in the absence of James Mayden, who was serving an academic warning and returned later in the first quarter. 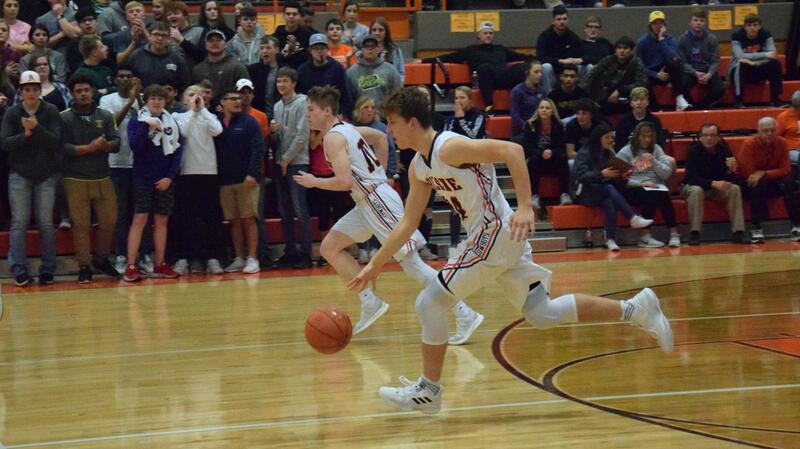 Coaches Graefe and Taylor consistently speak on the importance of excellent defense, and while Wyatt will occasionally foul, his defense is still one of the most effective in the NCKL, as seen in every game where he comes in off of the bench. His defense was on full display during February 5th’s K-State-KU pregame versus Council Grove. Wyatt accounted for two deflections, a block, and a handful of caused turnovers. Beyond that, he also was able to show off his range with two three-point baskets and a few free throws and assists. 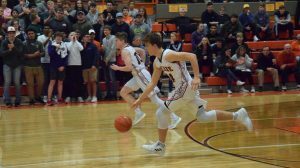 It turned out to be one of Wyatt’s better games as a varsity Cowboy, as the Cowboys rode a second half surge to put down the Braves 76-36 in a dominating victory fitting as a revenge game for last year’s loss. That game, a 14-point come-from-behind victory on behalf of the Braves, has been used as an example in many locker room situations for the Cowboys, with Wyatt being one of the main proponents. He watched most of that game from the bench. This year, he was able to put up 8 points against them in a revenge match at home. He continued to put up good numbers in Wamego against the Red Raiders in a tough environment before returning home to stymie a strong Hays squad that many said should have beaten the 4th-ranked Cowboys. Behind at the half and entering the fourth behind by ten points, the Cowboy defense, assisted by Wyatt, held the Indians to only three points while the offense surged to 14 points in the loudest come-from-behind victory the ‘Boys had seen all season. Wyatt scored five points. 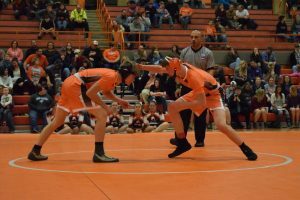 Victories against Clay Center and Chapman in Chapman could help the Cowboys earn a top seed during the state tournament which would allow them to play all substate games at home should they make it that far. Aside from his contributions to the basketball team, Wyatt is also a valuable tennis player who often teams up with fellow baller Tim Barbieri in doubles. The duo accounted for a few wins in junior varsity action last year and are looking at possibly being varsity mainstays for this season once basketball dies down. But, as of right now, basketball is the main focus for Wyatt. As it should be. The Cowboys are looking at a tight league race, combating Wamego, Marysville, and the possible resurgent Chapman. With Coach Taylor’s 5-for-5 strategy working wonders in the mid-first quarter and beyond–Wyatt being a major part of that–it is likely that he will see his uses rise even further than in previous weeks, especially after his 8-point (and could have been more) performance at home against Council Grove, assisting in stopping the bleeding at Wamego, and his defensive masterclass in the fourth quarter against Hays. With substate on the horizon, the dying sun over Wyatt’s basketball career has never been brighter. It’s not crazy to say that his best days of high school basketball are in front of him. His role off of the bench may not be the most glamorous a senior could obtain. Yet the image of him dancing with Coach Taylor and the rest of the Cowboy team following the upset of Hays pretty much tells the whole story: Wyatt, no matter what the score may be, is all in. Braydon (left) faces junior Colby Mohr in a preseason scrimmage in 2017. ABILENE, KS – Gym A – Wrestling meets at Abilene High School are a big deal, garnering attention similar to that of league basketball games. 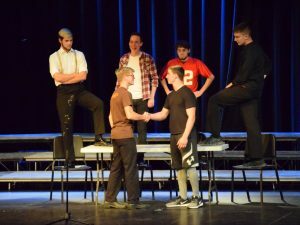 However, in many stark ways, the differences combine for an entirely different atmosphere–one that senior Braydon Surritte knows well, as he is present for both. Braydon first started wrestling in middle school. “I started wrestling in 7th grade,” he said. He has consistently done well in practice, as well as in limited action on the road. Long-since a sport Braydon found interest in, wrestling continues to be a sport that he finds new ways to reinvent himself in. Wrestling in the difficult and highly competitive 152 weight class, he went 2-3 in Manhattan. Despite him falling to Concordia 6-2, the team won decisively. At the McMillen tourney, Braydon placed 7th and scored his team seven points. Wrestling is not the only activity that Braydon is involved in. In the fall and summer he ran cross country and track. 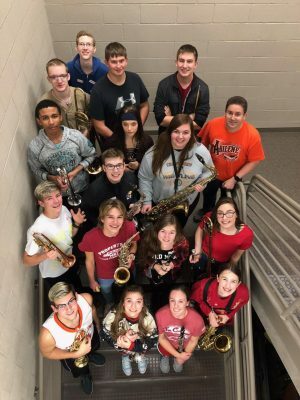 His musical talents brought him everywhere from the choir seats to the musical stage and to the pep band, which is consistently one of the best in the state. Braydon, second from the bottom left, with regional placers. Braydon joined the band program in Abilene back in middle school and has been excelling at the trumpet chair ever since. He can be seen in the risers behind the basketball goal during the home games, providing a bravado for other trumpets. “I have been in band since 6th grade. I started out on the trumpet. As I got further into it, I began to love it more and more. 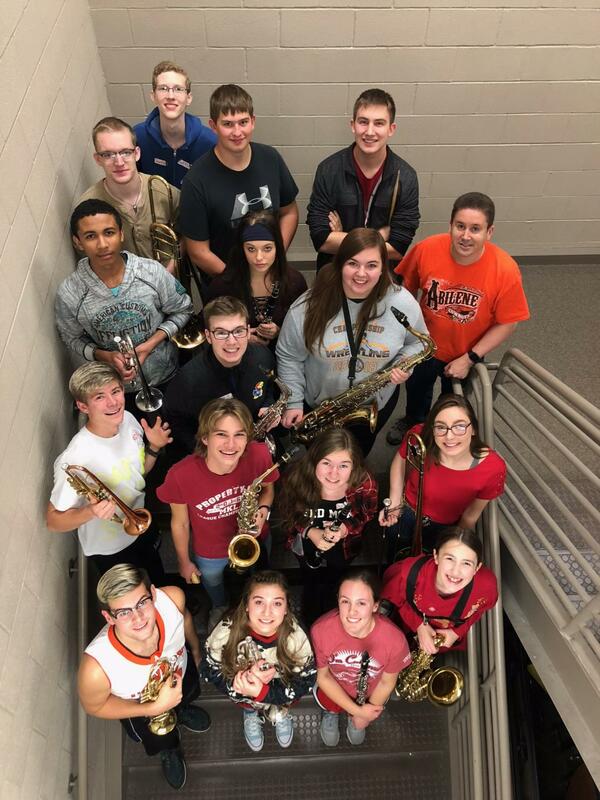 Now that I am a senior, I feel like I have really taken on the responsibility of the senior role in band by trying my best to set a good example for the younger students,” Braydon said about his time in the band program. Braydon (front left) shakes hands with Dakotah Whiteley during a skit with the mens’ group (from left to right the others are: Dawson Whalen, Jackson Welsh, Lucas Cook, and Grant Weishaar; all seniors) based on a song featured in The Greatest Showman during the Fall 2018 vocal music concert. He has also excelled with Mrs. Whiteley’s Singers program for the last two years, performing a solo last year for the regional contests. A bass last year and a tenor this year, Braydon’s range and control continue to impress at the senior level. He also took his acting chops to heart, serving as Mr. Johnson in 2017’s production of Bye Bye Birdie and as a Roman Ghost in 2018’s The Addams Family. “I enjoyed both experiences a lot,” he said of the two monumental events in his singing history. During an especially concerning stint in the 2018 cross country season, Braydon noticed a need for leadership amongst a group of problematic young middle school boys. He expects to be a leader by example for the young pole vaulters and hurdlers come track season. It’s abnormal to find someone as spread out and successful in as many areas as Braydon is. He’s just happy to be involved.